Sale ends 5:00pm (AEST) 16 May 2019. Valid for travel: 1 - 31 May & 20 Oct - 20 Dec 2019. 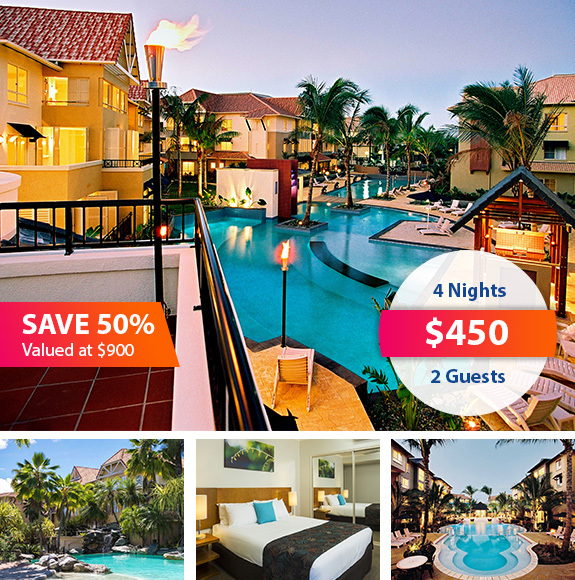 The Lakes Cairns is a unique 4.5 star resort situated on 11 acres (4 hectares) of lush tropical gardens just north of Cairns city. Holiday at your own pace. Relax at one of the four luxurious swimming pools or play a game of tennis. Enjoy the use of complimentary poolside barbecues or visit the resort store. The Lakes Cairns offers a range of open-plan apartments offering comfort and space, reminiscent of luxury Cairns hotel accommodation and apartments, with the added benefit of room to enjoy your surroundings. Choose from one, two and three bedroom apartments equipped with modern European appliances, quality furnishings and separate dining and living areas. Spacious living and dining areas open onto private balconies plus the 2 and 3 Bedroom apartments feature the magic of a lanai.